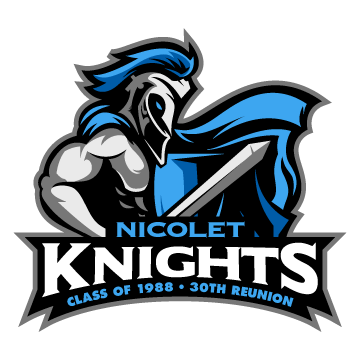 Our 30 year Nicolet High School reunion is coming up on Saturday, July 28th! We have a fabulous evening planned at the beautiful Rumble Room in the Harley-Davidson Museum. Drinks, plenty of food, dancing and an updated slideshow are all in the works. DJ Noah Lookatch (Alum Tedd Lookatch’s son!) will be playing music from the ‘80s and today. Plus, the entire Harley-Davidson Museum will be available to us for free tours during the evening! So buy your tickets and let’s party like it’s 1988!!! Don’t miss out on a private tour of Nicolet High School (it's been renovated!) on Saturday morning at 10:00am, conducted by the current Principal and the Alumni coordinator. 2) Fill out the Nicolet Class of 88 Contact Form (coming soon via email) so we can update our records and send out postcards. 3) UPDATE your profile on this Reunion Website! 5) Book your hotel soon! We have a limited # of discounted rooms held at: Holiday Inn Airport, Intercontinental Downtown, Holiday Inn Milwaukee Riverfront, Marriott Residence Inn Milwaukee Downtown. Please also SPREAD THE WORD about the reunion to your classmates, and point them to this site if you don't find them on here. To commerate the event, we're selling a Class of 1988 t-shirt. keep the price lower and SHIPPING IS FREE. Shirts are available in: white, black, navy blue, royal blue, charcoal grey or pink. All shirts are custom printed to order so u can select the size and color that you want. Know of any missing Nicolet Class of 1988 classmates? Use the email box on the right of the home page to send an invite to our site. #1) Mr. Kessler was voted overwhelmingly "Most Memorable Teacher"
#5) How much do you think you've changed, physically, since graduation? 50% said, "Some, but I feel about the same."